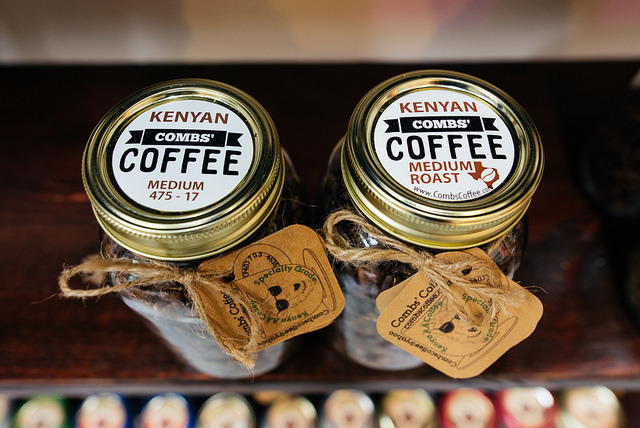 Sitting inside a small Corinth shopping center near North Texas Central College lies one of the few solar-powered coffee and cacao roasters in America: Combs’ Coffee. Everything in James Combs’ business is run by a 17-panel, 5.7kW solar system from the aquaponics that grows the coffee to the electric cars he uses to make deliveries. After the first 60 months of use, the panels should produce 40 years of free energy. Combs started this self-funded journey into specialty teas and coffee importers five years ago in 2013 when his daily life in the financial world was not cutting it for him anymore. His future was brewing in his cup of coffee. With the solar power, he figured out what worked to what didn’t work and sorted it the plan from there. As a small businessman, he did the whole setup himself. “We didn’t have an epiphany and said, ‘Oh, we’re hippies,'” Combs said. He started at the end of the coffee business cycle where instead of learning about importing the coffee and moving them, he traveled to Ethiopia and Kenya to learn directly with the farmers what coffee is about. The aquaponics system they use has three systems in it, but the current favorite for James is the media beds. Inside the system, which raises fish and produce at the same time, Combs has a range of different fish like bass, catfish, tilapia and Bluegill. The whole point of the setup is to make everything work in a self-sustaining cycle. Every single part of the system helps each other. In this fashion, the whole system uses 90 percent less water than traditional farming techniques. “They’re all pieces of a puzzle coming together,” said Fred Christensen, a frequent customer and Combs’ close friend. Aquaponics has shown Combs that with the right climate control you can grow coffee anywhere. Besides the main products he advertises, Combs is growing peppers, herbs and other vegetables inside the greenhouse that the whole aquaponics system is housed in. However, the biggest problem Combs experienced with getting all set up was with the solar power. They can only roast a certain amount of coffee from their electric roaster, which uses 1,500 watts of power. Other things, like a simple kettle to boil water for coffee, takes up 1,000 watts of power. 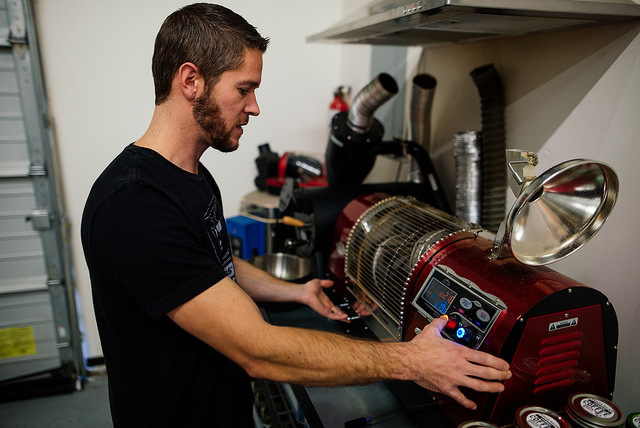 Owners also have to get the city to approve zoning for a roastery and find a landlord who is willing to meet the intentions of conversion to solar power. 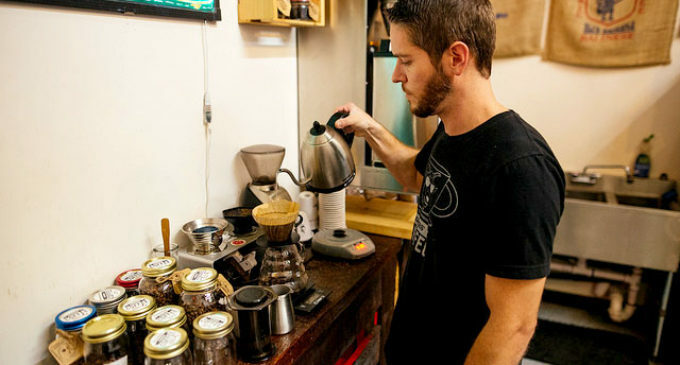 Dean Underdahl is the founder and barista for Java Rocket, a local “coffee house on wheels.” Underdahl uses Combs’ Coffee and takes his lead in sustainable business aspects like using 100 percent compostable straws and all recyclable drinkware. Most coffee, tea and chocolate farmers will pay the fair trade price, which is a little over $1. Instead, Combs pays over 100 percent of what other big coffee companies are usually willing to pay. He said he does this to make sure the growers and workers are sustained throughout the world. There are over 36 varieties of coffee owners can grow and each one will come out different depending on soil composition, temperature, rainfall and much more. Coffee originating from Ethiopia will have a more subtle floral tone while coffee from Costa Rica will taste sweet and almost like dried fruit. James’s business philosophy is wholly about sustainability — the countertop is mostly comprised of reclaimed wood and mason jars used of the lights. While he likes his small spot just across campus, Combs wants to move onto a plot of land and have a whole warehouse to work with. He hopes to expand the business and aquaponics systems even more, showing other companies and people there are renewable ways to crop coffee, tea and cacao.